Kon Ichikawa's The Burmese Harp / Biruma no tategoto / ビルマの竪琴 (1956), based on Michio Takeyama's 1958 novel of the same name. Set-up: Japanese soldiers are abandoned to their fate in Burma (now Myanmar) near the end of the Second World War. Focus is on one company, led by a captain who had been musically trained in civilian life, and who has his troops sing to boost morale. 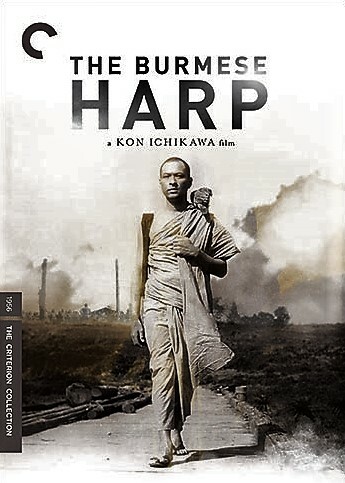 One of his privates, Mizushima, has taken up playing a Burmese Harp, and seems already otherworldly at the beginning of the film, only to become more so. The company tries to make its way to a safe zone so they can somehow return to devastated Japan, but are eventually overtaken by British (including Sikh) forces at a Burmese village. Though the war is officially over by this time, mortal danger persists. Another detachment of Japanese soldiers refuses to surrender -- death before dishonor. Mizushima is sent to Triangle Mountain to convince them to choose life over death. Will he succeed? 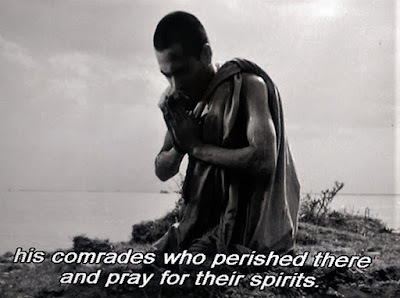 The rest of the film involves Mizushima's becoming a Buddhist monk, choosing to remain in Burma to bury abandoned Japanese war dead (apparently killed in large part by air and artillery attack), combined with the rest of his company, now POWs, trying to figure out whether he's dead or alive, and if the latter, hoping he will return with them to Japan. 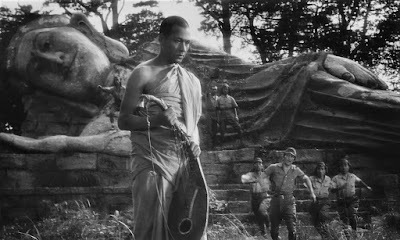 The Burmese Harp is an effective and sad film, distinctive in its long-term philosophical and religious considerations. For example, it's noted that neither the Japanese nor British empires will reign in Burma -- which became independent in 1948, though it still suffers ethnic turmoil in the 21st century. Kon Ichikawa (1915-2008) directed, but he worked in close collaboration with Natto Wada (1920-1983), the script writer, who also happened to be his spouse. Ichikawa did a color film remake of The Burmese Harp in 1985, but I haven't seen it yet.